Our fall Community Tree Planting (CTP) season kicks off this Saturday afternoon with the planting of 25 trees on the grounds of St. Paul's Episcopal Church, Rock Creek Parish in NW. Those doing the planting are our new batch of Citizen Foresters enrolled in this week's Tree Planting class. This is the first of 20 tree planting events scheduled to take place this fall between October 2 and December 11. 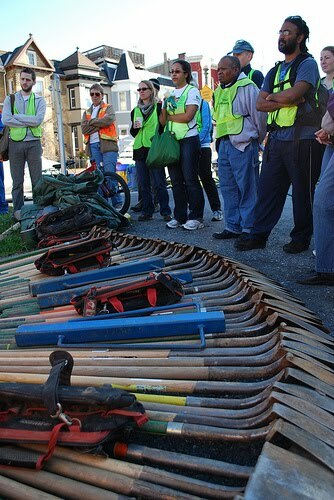 When winter hits, over 400 new trees will be calling the District home. Thousands of volunteers have helped us plant trees across DC through the CTP program since it launched in 2005 but not everyone knows how planting sites are selected, where the trees come from, the role of Lead Citizen Foresters in stewarding the projects, how all the trees and tools magically appear the morning of the planting, who the saint is that delivers coffee and bagels and so on. The next two weeks of blog posts will demystify the process and bring much deserved attention to those who make the re-treeing of DC possible. Our very own Urban Forestry Manager, David DiPietro, will author the posts and get us excited for fall - the ideal time to plant trees. For those of you interested in volunteering to help plant trees, view the complete fall CTP schedule, then sign up to attend. If you would like to become a Citizen Forester, make a day of it and register for the Tree Planting class this Saturday, October 2. All our classes are free unless noted. CTP 411: Where Do the Trees Come From? CTP 411: How Are the Tree Species Selected?